UPDATE: Josh records Cardinal Pell’s speech (on which this article was based) in cartoon form here. The irony – a spiritual leader within a faith-based belief system (the Catholic Church) possesses far more capacity for rational thought than thousands of “scientists” and politicians swept up in the quasi-religious tide of climate alarmism. We can only attempt to identify the causes of climate change through science and these causes need to be clearly established after full debates, validated comprehensively, before expensive remedies are imposed on industries and communities. I first became interested in the question in the 1990s when studying the anti-human claims of the “deep greens”. Mine is not an appeal to the authority of any religious truth in the face of contrary scientific evidence. Neither is it even remotely tinged by a postmodernist hostility to rationality. My appeal is to reason and evidence, and in my view the evidence is insufficient to achieve practical certainty on many of these scientific issues. Recently Robert Manne, following fashionable opinion, wrote that “the science is truly settled” on the fundamental theory of climate change: global warming is happening; it is primarily caused by the emission of greenhouse gases, especially carbon dioxide; and it is certain to have profound effects in the future . His appeal is to the “consensual view among qualified scientists”. This is a category error, scientifically and philosophically. In fact, it is also a cop-out, a way of avoiding the basic issues. The basic issue is not whether the science is settled but whether the evidence and explanations are adequate in that paradigm. I fear, too, that many politicians have never investigated the primary evidence. Much is opaque to non-specialists, but persistent inquiry and study can produce useful clarifications, similar to the nine errors identified by the British High Court in Al Gore’s propaganda film, An Inconvenient Truth. The complacent appeal to scientific consensus is simply one more appeal to authority, quite inappropriate in science or philosophy. I agree completely, as he says…”My appeal is to reason and evidence, and in my view the evidence is insufficient to achieve practical certainty on many of these scientific issues.” Hear, hear! Wow! That is just truly brilliant! Not just what he said, but the fact that he said it. Stunning. He is rightly concerned about a competing religion. It is time someone tested the Constitution on this. The Commonwealth is not allowed to “establish” any religion, nor can there be any religious test for appointment to any position. I look forward to a global warming sceptic being put on the Climate Commission gravy train. I’m far better suited for a position … have science and masters degrees in non-related subjects … and the bonus income would be much appreciated. Also can do a great impersonation of a ventriloquist’s dummy. There’s heaps more evidence for god than AGW, and I’m an agnostic. No doubt Gore (not a scientist himself) and all the greens will knock him down as not qualified, but then again, how many jury members are qualified in law? “Much is opaque to non-specialists, but persistent inquiry and study can produce useful clarifications,…” Interesting how useful clarification exposed the non specialist Gore ! There is no God but Gaia and she is under assault from evil man-made carbon dioxide and the only way to stop this blasphemous assault is for our government to take control of more of our money – and quickly, to save us all from catastrophic Gaia induced climate changing events. Those skeptical heretics who disagree with our noble religion, will be outed and tattooed by the Inquisition, led by the IPCC brethren. Our holy scriptures, the Fifth IPCC Assessment Report (AR5), written by our pal-review monks, is the undeniable truth of Gaia’s word. Baldrick, of all posters . ….The golden rule of a clarification specialist is not to make any assumptions! I would therefore humbly and respectful suggest that unless you can incorporate proof, that you reference “Gaia” as gender non specific. With thanks to this Tim Blair piece 3/1/2011. Thank you kind clarification specialist for that gender clarification. Will treasure Tim Blair’s piece as one could easily conclude that an Australian of the year is nuttier than a fruit cake. Maurice Strong wrote the Majority of Agenda 21 for the UN. Agenda 21 promotes AGW amongst other controls, such as taking away Private Property Rights, and Maurice Strong is the leading light of the new age green religion Gaia. Watch the greens rile up now. 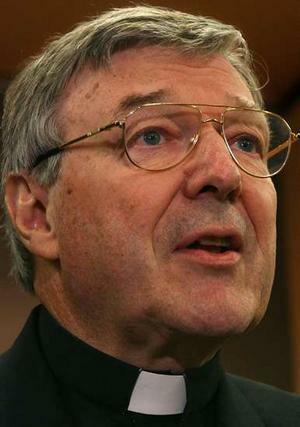 Expect the full anti catholic fury to be directed at both Pell and Abbott. This however will be good news for the sceptic cause as they will certainly alienate a lot of conservative catholics which will make the carbon tax even more unpopular( if that is possible. )Also expect a backlash from the liberal greenie side of the catholic church, especially some of the radical greenie nuns who have their own warmist agenda. Sorry Baldrick – I know what you were doing /saying, but I am afraid it made me want to puke! Forget the religosity etc… look at what the man said – it is correct……..
…..My appeal is to reason and evidence, and in my view the evidence is insufficient to achieve practical certainty on many of these scientific issues…..
Never in my wildest dreams did I think that I would ever agree with George Pell on anything. But I do on this. I’m all for the content of Cardinal Pell’s speech in London, bravely spoken, but I wonder how he stands with the Vatican’s statements from “Vatican scientists” and previous statements from Pope Benedict ? It appears that the Vatican accepts the IPCC & Al Gore view of climate change. Talk of Global Finance and Global Governance ! Hopefully the “Inquisitors” won’t slap him on the rack, or fit him for an Iron Maiden suit. What a champ! I’m liking this chap more and more. For an agnostic, I find this fascinating: clear and reasonable thought from the head (well, Archbishop) of an organised religion; unreasonable and unethical thought is coming from atheists and extreme greenies. You’d think it would be the other way around. What’s even more interesting is all those youths – indoctrinated by ‘save the planet’ secondary and tertiary institutions – enthusiastically make pilgrimages to World Youth Day celebrations every few years. Now one of their cardinals is making these statements that challenges what they’ve been taught [I can only take this view from the Australian pilgrims I know of, not any other nationality]. Hmmmm. Which school of indoctrination will they ultimately follow? By the way Mk II: by atheists I mean those like Juliar and extreme tea cosy wearers – it’s not meant to be a blanket statement for all atheists. I know atheists who are against all this carbon tax and ‘the science is settled’ guff; but then I know of a helluva lot of others who are I-can-save-the-planet-with-my-over-educated-non-God/Allah-brilliant-mind, self-righteous…um…people [preferred word would have been snipped]. Those are the people I’m referring to. Time to exit the stage, methinks. This guy should be the next Pope, any chance of that? The ACLU is asleep at the wheel when it comes to this Green Religion. Solyndra is an agregious violation of the separation of church and state. And Bank of Rome says, Shut up!